Bold brash Korea has struggled with many dirty elements, some described here before (link). Won Sei-hoon 원세훈 headed South Korea's feared National Intelligence Agency. 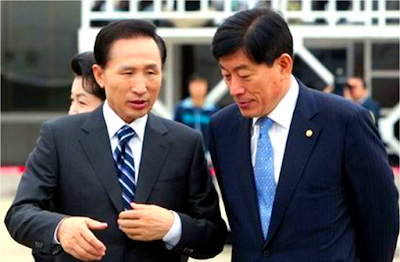 Convicted of undermining Korea's 2012 Presidential election (where Park Geun-hye attained power), his crimes & punishment have slithered half-hidden through Korea's justice system -- probably in part because he helped the candidate who subsequently became President. Now Won, Park and her cronies are disgraced, and some justice is promised. But in fact, surely Won was doing dirty work for other more powerful people ("helping" far beyond mere politicians, and possibly beyond the borders of the ROK). His stories are valuable, but seem likely to remain hidden.